It had taken all day and all night, but sure enough, as Ziva promised, the morning after the merfolk had begun, Jhoira stood on the shore looking at what was left of the great skyship Weatherlight. They were on the coast of Bogardan in a cove with a wide stretch of beach, protected by rocky outcrops on each side. Above the dunes was a flat stretch of grassy ground where the Weatherlight now lay. Some distance inland, dark volcanic peaks rose past undulating lava fields. All that was left was the skyship's Thran metal skeleton, nearly two hundred feet long, and the bulky coils of its engines. The rest of its hull and interior had decayed away or been destroyed in the battle that had sent it to the bottom of the sea. Jhoira's mechanical owl flew over it, giving her an overhead view of the wreck through its eyes. It looks worse than it is, Jhoira thought. She touched the locket around her neck, reminding herself that she had options, if the ship's core was more damaged than she hoped. Between the merfolk and her human salvage crew, they had wrestled the remnant to the surface. The Tolarian supply vessel where Jhoira's diving ship was now stored had pulled the Weatherlight into this sheltered cove, and then they had winched and levered the wreck up onto the flat ground where the restoration work could begin. The supply ship was anchored off the beach now and the salvage crew was putting up a camp near the Weatherlight. They could start the work as early as this afternoon. The other ship anchored in the cove was Jhoira's private barque, and though much smaller and shaped like an ordinary sailing vessel, it was as much of a mechanical marvel as her diving ship. Now I just need a crew, Jhoira thought. She missed Karn, Venser, and all the others. At least she knew where Teferi was, though there was no telling whether he could be persuaded to help or not. And there's Jodah. Her expression turned wry. She didn't know if she could count on him, either. It had been so long since Urza's final powerful spell had all but ended the Phyrexian invasion, and Dominaria had healed so much since then. But some things would never heal. It didn't matter. Whatever happened, Jhoira would find a way. She always had before, and she didn't expect that to change anytime soon. This is too important, she thought. Wind stirred her hair, and the angel the Church of Serra had sent her landed on the sand. Her name was Tiana, and while she seemed perfectly amiable, Jhoira had detected some air of sadness about her. But glancing at her now, Tiana looked more animated. In fact, she looked positively incandescent. Literally incandescent. Curious, Jhoira asked her, "Do you mean to be glowing like that? Is something wrong?" Her expression rapt, Tiana didn't seem to hear the question. "The shape." She gestured toward the Weatherlight's bare spine. "It's Gerrard's blade in the portraits." She shook her head. "Of course! I don't know why I didn't realize that before." Studying her, Jhoira pointed out, "You're not only glowing, you're smiling." Tiana dropped her gaze, suddenly self-conscious. "Sorry about the glowing. And you've seen me smile before." "Not like that." Not like someone who had lived in the dark seeing the sun for the first time. There was gravity to that smile, as if it could pull in everyone around it like a temporal anomaly. Jhoira's eyes narrowed in concern. "And now you're crying." Tiana rubbed at her face with her white sleeve. "No, it's not, I'm not . . . There's a lot of sand in the air today, I'm surprised everyone isn't crying." It had rained earlier and the sand was still damp, and the breeze had nothing in it but the salty scent of the ocean. Jhoira reached out and gently lifted Tiana's chin. She asked softly, "Why are you crying?" "I really don't know." Tiana took a deep breath, and stepped back, wiping at her face. "Seems to be going away now, whatever it is." Jhoira wasn't so sure. She looked from Tiana to the skeletal hulk of metal rising above them. This couldn't be a coincidence. When Tiana had arrived before the salvage started, she had explained that she was a guardian angel but with nothing in particular to guard, so she was available for the church's long-distance errands. Now Tiana seemed to be trying to avoid looking at the skyship, like a shy lover trying not to reveal the object of her devotion. Tiana had to be reacting to the Weatherlight. Jhoira thought, Barely anything but her bones left, and the old girl still has it in her. "Come on," she said. "Let's take a look at the Powerstone." Hadi and the other salvagers joined Jhoira and Tiana in the Thran skeleton that was all that remained of the Weatherlight's hull. 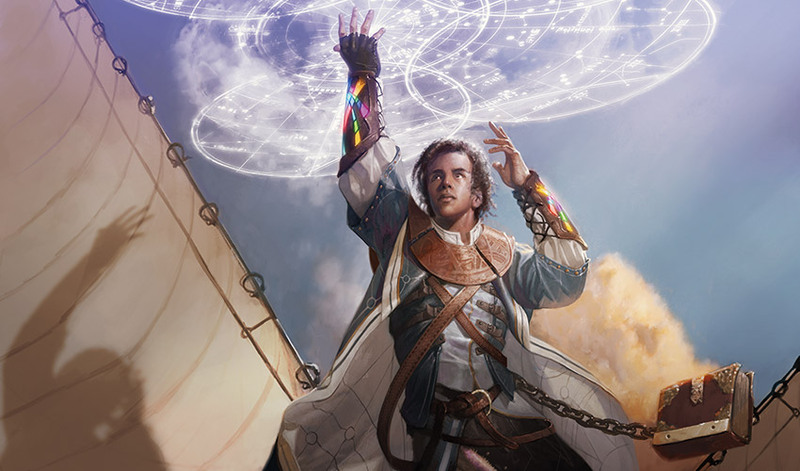 Hadi was the only Tolarian artificer, but the others were skilled artisans and scholars, mostly from Benalia and Jamuraa. Tien, their chief metalworker, stood beside Hadi, and she held the second most important component to this enterprise: a new hull seed Jhoira had obtained from the tree elemental Molimo. It would regrow the Weatherlight's hull once the artisans finished cleaning the Thran metal supports, but they still had to get the engines and other mechanical systems working. Some were magical, some not, and from the look of them, all would need a lot of work. But the first, most important component sat nestled in its metal cradle in the depths of the engine. It was the Powerstone. "Well, it's still here," Hadi said dubiously. "That's a good sign," Tien added, standing on tiptoe to see the teardrop-shaped crystal. "Isn't it?" Jhoira wasn't so sure. The Powerstone seemed inert. It had been created by Urza, who had collapsed Serra's Realm into the stone. Which was the reason Tiana had been sent here; the stone was a sacred object for the Church, so they had wanted an angel present to oversee its reclamation, and to return it if it no longer functioned. Jhoira had a backup plan if the stone had been destroyed or drained, but it was something she would rather hold in reserve. Jhoira had faith in the old stone. Maybe it just needed a little prodding. "What do you think?" she asked Tiana. Tiana leaned forward to study it and frowned thoughtfully. "It's intact; the connections in the cradle look good. The motivator's still attached. That's surprising after what it's been through." Hadi and Tien glanced at her in surprise. Tien said, "I didn't think angels studied mechanics." "We don't," Tiana said hastily, stepping back from the cradle as if it had burst into flame. "I don't really know anything about it." "Don't you?" Jhoira lifted her brows. This was the second time Tiana had reacted to the Weatherlight like it was a long-lost friend. Tiana looked uncertain. "I don't think so. I've never known anything about mechanics before. But . . . it just seems obvious now." Hadi and Tien watched her with interest. Jhoira said, "This is Serra's stone. Perhaps it'll respond to you." Tiana eased forward again, more self-conscious than reluctant. "I'll try." She examined the stone for a moment more, then pressed her hands together and lowered her head. Jhoira watched her, aware everyone gathered around had stopped breathing. For a long moment nothing seemed to happen, then an inner light suffused Tiana's features. Jhoira felt the shift in the Powerstone, the moment when it came to life again. Like some powerful entity had appeared in their midst. As the stone started to glow, the others gasped and cheered. Tiana stepped back, eyes wide. Clearly she hadn't been expecting a success. As the others celebrated, Jhoira drew Tiana aside, under the shadow of the skyship's arching girders. "Forgive me, I don't think I've met an angel like you before." "You mean an angel who lacks confidence in her angelness?" Tiana's expression was wry. "It's a long story." Jhoira made her decision, partly instinct and partly a calculation based on careful observation. "Would you like to help me more than you already have?" Tiana shrugged a little, kicking at a tuft of dirt. "Sure, I don't have anything better to do. I mean, I might as well help you. Do you need me to fly somewhere for you?" "No, I need someone to supervise the reconstruction and protect the workers while I gather a crew." Jhoira smiled as Tiana went still. "Do you think you would like that?" Tiana turned to look at the engines, at the artisans who were already planning their restoration. No, Jhoira hadn't been imagining it; Tiana had an affinity for the Weatherlight. Sounding as if her throat had gone dry, Tiana said, "Why me?" "You have the aptitude, I've seen it. And you're an angel, so I know I can trust you." Jhoira eyed her. "What do you think?" Tiana let her breath out slowly. "Yes. I think yes." Gathering her crew would be a long journey, but Jhoira had planned and prepared for it, just the way she had for the Weatherlight's recovery. Leaving the supply ship behind, she took her barque to the coast of Jamuraa first, to the city of Suq'Ata, where previous inquiries had suggested she might find the person she was looking for. Some searching took her to the giant market of the city, where multistoried buildings of white stone with broad terraces formed a man-made canyon of warehouses, shops, offices for cargo factors, and the inns and hostels needed to house, feed, and entertain the crowds who came to do business there. Tall palm trees and flowering shrubs grew in large pots, and fountains decorated every plaza. Mechanical parrots and monkeys, similar to Jhoira's owl, guarded the goods of the open-air shops. 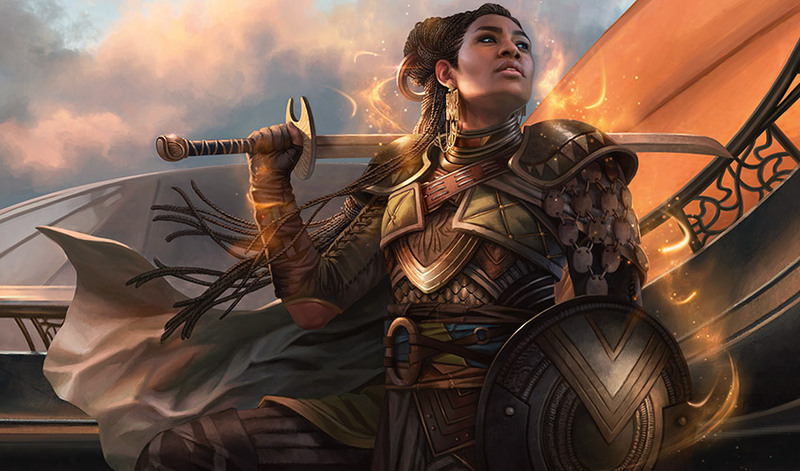 There were people here from all over Dominaria, but the locals mostly had the brown skin and dark hair of northeastern Jamuraa, or the much darker coloring that marked Femeref and the descendants of lost Zhalfir. It was a hot afternoon and many of the merchants, their customers, and the others working in the market had stopped to have tea, honey figs, and dates under the awnings outside the various tea houses and wine bars. Jhoira was considering that herself, if she couldn't run down her quarry in the next hour. She climbed the stairs to a plaza. Water rushed down a series of fountains and falls built into the walls of a large complex of cargo offices and warehouses. People were seated under a shop's awnings, and going in and out of the big arched doorways on the two terraces above this one. Jhoira paused, trying to decide which level to search first, when sudden screams rang out from above. Everyone in the plaza and the shops around it turned to look, or froze in shock. Jhoira saw people running from a large archway two levels above and sprinted for the stairs. She reached the upper terrace in time to catch an old man who almost tumbled over the edge in his haste to get away. "What's happened?" she asked as she steadied him. "The Cabal!" he gasped. "A Cabal spy in the treasury of the Sarin Mercantile!" She set him aside and ran for the archway. Just inside, in the large open court of a cargo warehouse, two Jamuraans lay sprawled on the paving. From the alarmed yelling and the direction the others in the court were running, the fight was happening up on the roof of the warehouse. 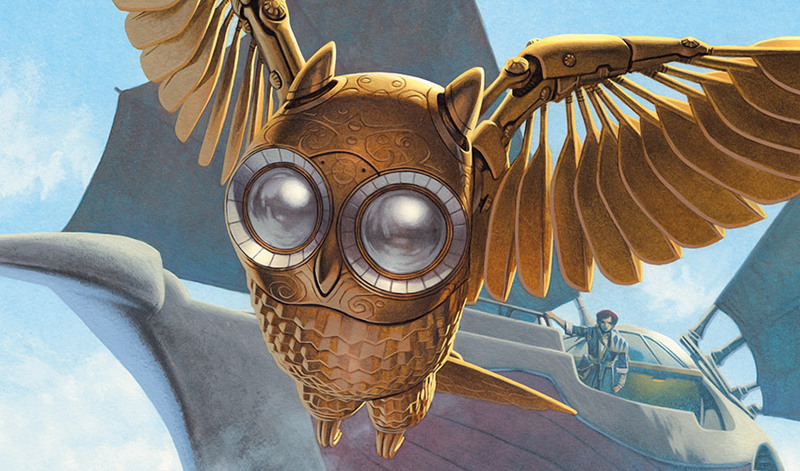 Jhoira touched the mechanical owl perched on her shoulder and whispered, "Be my eyes." It chirped and shot straight up in the air to circle above the warehouse. Jhoira split her attention between the court and her familiar's view. There was a terrace atop the warehouse roof, overlooked by a taller building with balconies. On the flat stone plane of the terrace, one woman with a sword fought half a dozen men wearing the concealing robes of desert nomads. Around them, dark magic with a demonic taint hung in the air like a fog. The swordswoman had dark skin and dark hair in a crown of braids, and was dressed in metal and leather armor. The woman's blade knocked aside a spear thrust, and she used her momentum to twist in and take a chunk out of her opponent's neck. As he collapsed, she shouted at the others, "Are you done?" A man howled in fury, his hood falling back to reveal pale skin and a shaved head marked with livid scars. A Cabal cleric, Jhoira thought. He was using dementia magic, creating phantasms that were causing everyone else in range to run for their lives, but it clearly wasn't affecting the woman. She dispatched another cultist with a thrust to the chest and the cleric flung a death spell at her that manifested as a black orb. It struck her chest, but the woman ignored it. The owl's gaze focused in, and as the cleric cast another death burst, Jhoira spotted the faint gold light that shone around the woman as the spell struck her. Not a shield, she thought, starting to smile. It was an immunity to magic, and she had seen it before. Jhoira had found her quarry. She called her owl back and started for the stairway. She arrived on the terrace in time to watch the woman plunge her sword into the last cultist's chest. As she was wiping the blade on his robe, several city guardsmen ran out of the nearest archway. "Shanna Sisay!" one called out to her. "What happened here?" "What does it look like?" the woman, Shanna, called back. "Cabal agents, trying to get the merchants' route maps, so the Cabal can attack their ships and caravans. People forget they started out as common thieves in Otaria," she added as Jhoira approached her. "They do forget," Jhoira agreed. "The demon Belzenlok wants to rewrite the history of the world, with himself as the force behind every act of darkness, all the way back to the fall of the Primeval Dragons twenty thousand years ago." Shanna sheathed her sword. "You know your history." Jhoira did know her history, having caused a great deal of it herself. "And you're immune to magic. The cleric's dementia spellcasting had no effect on you." Shanna shrugged, watching her thoughtfully. "It's a family trait." "I know. I knew your ancestor, Captain Sisay. I see you carry her sword." Shanna went still, staring at her. All the sound and movement of the guardsmen and the growing crowd of spectators from the archways and balconies suddenly seemed far away. It was only her and Jhoira in this moment, a meeting that would be chronicled in the true history of this age. Shanna asked softly, "Who are you?" She smiled. "I'm Jhoira. I came here to find you." They retreated to a wine bar on a lower level and sat on the carpets under one of the awnings. The activity in the streets and plazas slowly returned to normal around them. Shanna asked, "How did you find me?" "I've kept track of your family, and one of your cousins told me you were here in this city, following rumors of Cabal spies." Jhoira sipped her wine. "They said they miss you." Shanna set her cup aside. "I miss them. But all my life I've heard about my ancestors, and tales of lost Zhalfir. I got tired of living under the shadows of the past. I decided to make use of my inheritance." She smiled. "I have so many questions." If Shanna agreed, they would have plenty of time to discuss the past. 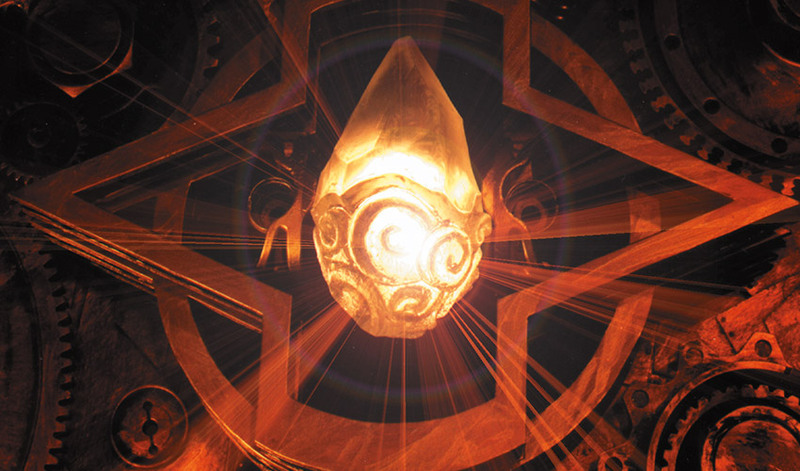 Jhoira said, "And I have answers, but hear my question first: Would you consider serving on the Weatherlight?" Shanna laughed. "If it still existed, I'd consider it." Then, as she took in Jhoira's expression, her face turned sober. "I'd consider it an honor, to follow in the footsteps of my ancestor. To serve as she served. If the Weatherlight existed." Jhoira raised her cup. "Then I would consider it an honor to have you on my crew." By the time they sailed the barque to Aerona and reached Benalia City, Jhoira was even more certain she had made the right choice. Shanna wasn't Sisay reborn, but she was enough like her that at times it was almost painful for Jhoira. They spent long nights on the deck under the stars, talking, and it brought back buried memories. Jhoira was glad to have Shanna with her, but it made her miss Sisay all the more. She was expecting the same success with Danitha Capashen, who was distantly related to Captain Gerrard, but Danitha's answer was short and final. They were sitting in the garden of the Capashen townhouse, and it was late morning on a fine warm day. Birds sang in the trees and the gray stone walls sheltered the garden from the bustle of the city. "No?" Jhoira repeated. She glanced at Shanna, who had lifted her brows in startled dismay. She turned back to Danitha, whose expression was as calm and unaffected as if they were discussing their preferences for lunch. "Do you think I'm lying about who I am?" "No, I know you're Jhoira," Danitha said, still calm. She nodded to Shanna. "And you're so much like the portraits I've seen of the original Captain Sisay, I couldn't possibly deny who you are." Danitha didn't resemble Gerrard, except in her warrior bearing. Her hair was pulled back, the sides shaved to better fit under a helmet, and her face was tanned and weathered. Jhoira had known she was a knight of Benalia, but she had thought Danitha would want to follow in the steps of her famous predecessor. "Then why?" Shanna asked. She gestured to the big stone house. Danitha had come in from the stables to meet them, and her sword and shield rested just inside the double doors that were open to the main hall. "Obviously you're not afraid of a fight." 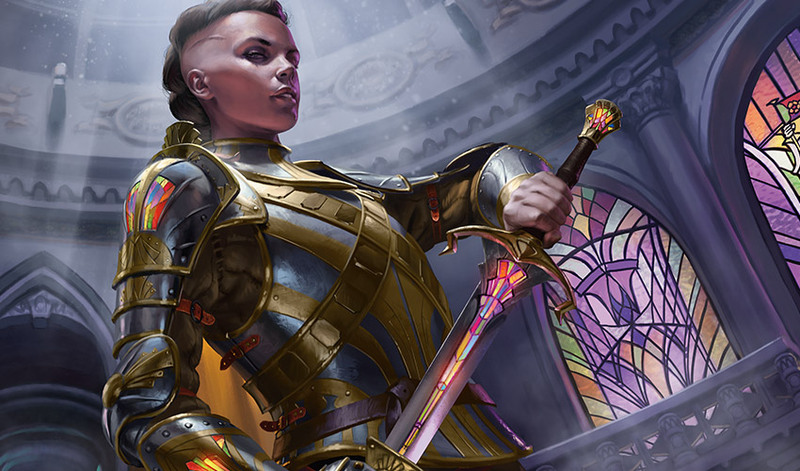 "I'm a knight of Benalia," Danitha told her. "I'm sworn to defend this land." Jhoira had depended on having relatives of the two most famous Weatherlight captains aboard. It had felt like the best way to begin the new voyages, and after meeting Shanna, she was certain she was right. She needed a Capashen. "The Weatherlight has always been at the center of the battle, and it's time to use it to fight the Cabal, to break their hold on Dominaria. Serving with us can only help Benalia." "In the long run," Danitha agreed, still without heat. She spoke as someone absolutely certain of her own mind, which just made Jhoira want her on the crew even more. "The Cabal is attacking outlying towns and villages all around us. If I went with you, we might be fighting the Cabal halfway across the world. I want to fight them here, in my home." "I understand." Jhoira leaned back against her chair and let her breath out in resignation. I can't argue with that, she thought. She looked at Shanna, who made a little gesture of defeat. Danitha nodded and pushed to her feet. "I need to return to my command. Stay here as long as you wish; you're both always welcome." As Danitha walked into the house, Shanna said, "Well? What next? Is there anyone else you had in mind?" "No." Jhoira wanted to slap the table in frustration, but didn't. Danitha had every right to refuse. "She was the only other I hoped to—"
A young man lurched out of the house, stared at them wide-eyed, and hurried over to the table. He gasped, "What about me?" Jhoira was already on her feet, Shanna beside her, but she realized it was unlikely they were about to be attacked. He was a young man with unruly brown hair who bore a strong resemblance to Danitha. "What about you?" Shanna demanded. He explained, "I'm a Capashen. I'm Raff. I heard everything. I want to go in my sister's place." Jhoira folded her arms. This she hadn't expected. "Do you?" Shanna studied him, frowning. "How old are you?" He drew himself up. "I'm old enough to be a trained mage. I passed every exam years early and astonished my teachers with my abilities." "So they're training mages at twelve, now?" Shanna asked skeptically. "Or thirteen?" Raff lifted his chin. "Jodah of Tolaria himself said I was one of the most accomplished students he had ever seen." Up to this point, Jhoira had been a little amused, but here she drew the line. "Jodah did not say that." Raff tried to brazen it out, but a line of worry appeared between his brows. "Oh, do you know Jodah?" "Yes." Jhoira folded her arms. "From before the Phyrexian invasion." "Oh. My sister said you were that Jhoira, but—" Raff visibly deflated. "All right, Jodah didn't say that, but I'm still an incredibly accomplished mage." Jhoira shook her head and turned away. But as she and Shanna moved toward the house, Jhoira sensed magic. Raff was lucky she realized it was an illusion, not an attack. The garden had vanished and she and Shanna were suddenly standing high in the air, drifts of cloud around them. In the distance the original version of the Weatherlight angled across the sky. The lines of its mast and hull weren't quite accurate, but it was a credible effort. Remembering Shanna's ability, she asked, "Can you see this?" "I can tell it's there, but I can see the house and the garden through it." Shanna gave Raff a thoughtful glance. "So is he any good?" Jhoira sighed and made herself evaluate Raff's skill more objectively. "He's not bad." She turned to Raff. "You've been very annoying today." The illusion vanished with a gesture. Raff said earnestly, "I won't be annoying any more, I'll be helpful. And I'm sorry for lying, I just really, really want to go with you." Frowning, Jhoira considered him. The problem was, Danitha obviously had no intention of changing her mind, which left Raff as the only option. "Give us a moment," she said, and stepped aside with Shanna. They moved away, under the willow tree close to the terrace. "What do you think?" she asked, keeping her voice low. Shanna said honestly, "I think I have scars older than that child." "True," Jhoira admitted. "But would you object to serving with him?" Shanna gave it serious consideration, her brow furrowed. "No. He's eager enough and his heart is certainly in it, and he seems to have the skills. I just . . . This will be dangerous and I'm not sure he understands that." Jhoira wasn't sure any of them understood what they were up against. She had lived so long, and seen so much, it was hard for her to imagine that someone as young as Raff would have any concept of his own mortality. But having a Capashen on the crew felt right. It felt necessary. "There is no safety while the Cabal exists. He could just as well die here fighting them." "That's true." Shanna shrugged a little. "I'm happy to serve with him if you think he'll be useful." Jhoira nodded and turned to Raff. She told him, "If you want to come, pack hurriedly. We have a long way to travel." It was morning when the barque sailed into the Bogardan cove. Jhoira stood on the deck with Shanna and Raff, using a telescope to impatiently watch the shoreline. Now she lowered the scope, able to see with her own eyes the familiar shape rising above the dunes. The hull was gracefully curved, the stern mast angled backward. The railings and glass of the ports gleamed brightly. From the upright way the ship sat on the ground, it must be already partially awake and supporting itself. The Weatherlight was whole and ready to launch. Jhoira grinned in delight. Everything had come together just as she had planned, and right on time. The camp had been disassembled, and the workers were using the small rowboats to load the last of their tools and equipment aboard the supply ship. They waved and cheered as the barque approached the shore. Shanna reached over and caught Jhoira in a one-armed hug. "I can't believe it!" Raff tried not to bounce with excitement. "There's an angel! Is that Tiana? Why does she have a vampire with her?" Jhoira and Shanna turned to stare at the figures waiting on the beach. "A what?" Jhoira said, baffled. Her plan hadn't included that. As they waded through the waves and up to the sandy flat, Tiana and the vampire came to meet them. Jhoira said, "Hello, Tiana. I take it everything's gone well." She nodded to the vampire, who was clearly a vampire, except he was dressed as a knight of Benalia and no one seemed to be wary of him. "Is there anything you'd like to tell me?" Tiana tucked her wings in and scratched her head. "Well, yes. This is Arvad." Arvad dropped to his knees and offered Jhoira the pommel of his sword. "I swear to serve at your side, Captain Jhoira." He seemed perfectly sincere. Jhoira's brows drew together. "I see." She looked at Tiana. Tiana said, "It's a long story." "I'm not sure we have time for it now." Jhoira pulled her timepiece out of her vest. 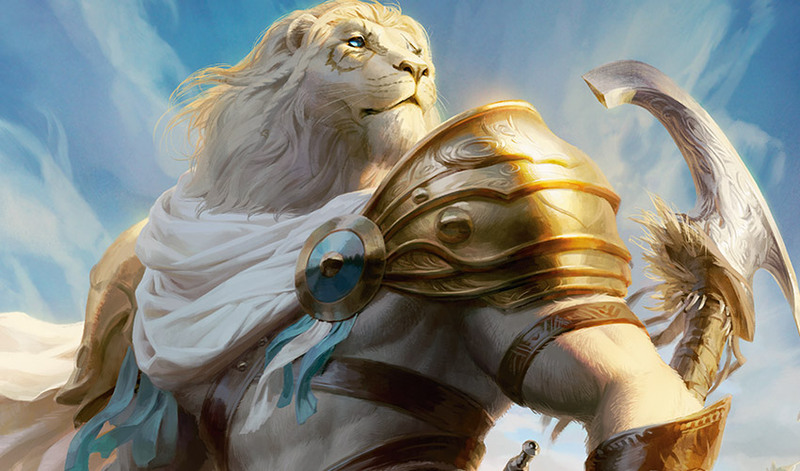 "I'm expecting a—"
With a rush of wind and golden light, Ajani Goldmane appeared on the shore. He gazed up at the Weatherlight with a satisfied expression. "—a friend to arrive." Jhoira smiled. "Now we are ready."